Home Blog Log Lines Sail Ho! When people talk about Constitution they like to employ hyperbolic language. The ship is the oldest, the best, the most successful – whatever. This past Sunday proved that these superlatives are not misplaced. For those of you who may have missed the media blitz, “Old Ironsides” sailed under her own power for the first time since 1997! 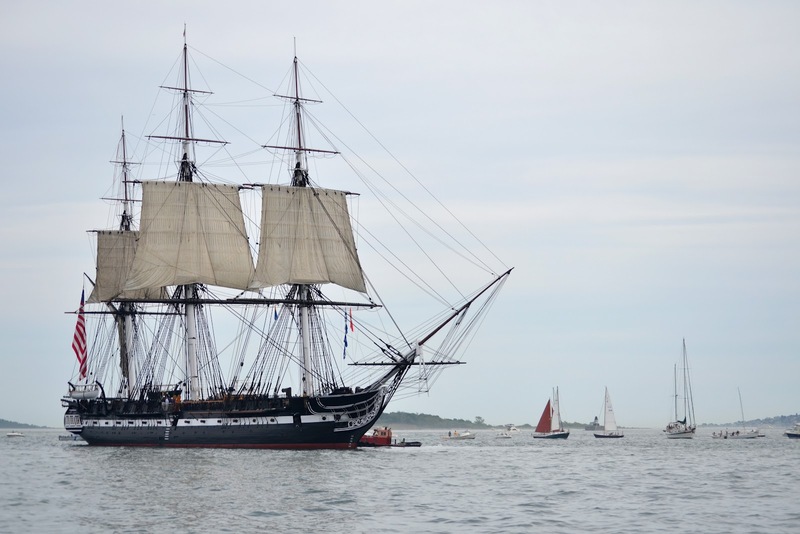 The event honored the ship’s August 19, 1812 battle with HMS Guerriere. It is Constitution’s most famous victory and the US Navy decided to pull out all the stops- and the tugboats. A tug moves Constitution down the harbor towards President Roads. The sails have been ungasketed and are hanging in their gear. Sunday was cloudy with a steady breeze from the northeast. Constitution got underway from the Charlestown Navy Yard at about 10 am. A tug brought her down the harbor, amid throngs of pleasure craft, to the seaward end of President Roads, the entrance to Boston harbor. 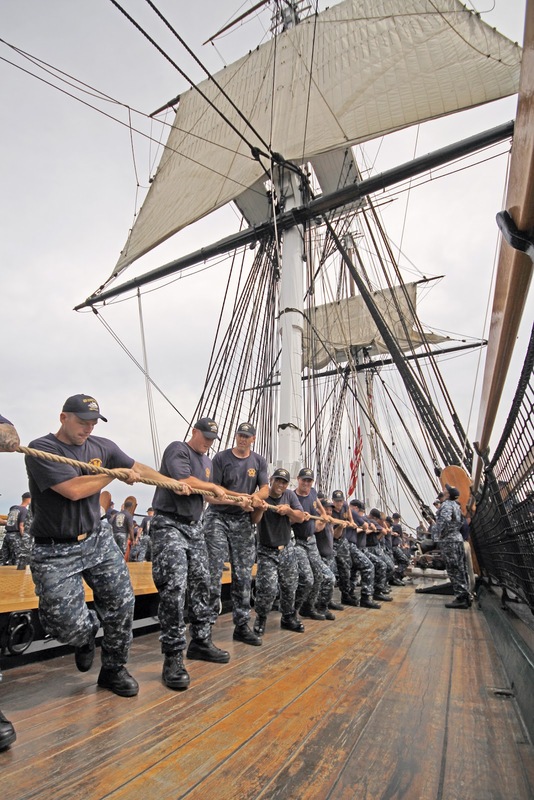 At slack tide the ship made a wide turn to starboard and her crew, including 150 Chief Petty Officer Selectees from throughout the fleet, hauled away on her sheets and halyards. Slowly the three big topsails spread to the wind. The anticipation was so palpable that even the breeze seemed to hold its breath. It died away to almost nothing, and the ship made only about 3 knots over the ground. Nevertheless, the tug dropped its towline and Constitution headed off for a 17 minute run down wind toward Castle Island. It was a magical moment. If one squinted a bit, one could almost imagine that it was 1812 and that Constitution had just returned from sea. The motorboats and sailing yachts were transformed into longboats and lighters filled with Bostonians cheering the ship’s victorious homecoming. Actually, there was no need to imagine the last part. The spontaneous blaring of horns and the applause of thousands reminds us all that Constitution is still America’s favorite frigate.